North Korean leader Kim Jong-Un said Saturday the country’s second ICBM test demonstrated the ability to strike any target in the United States, in a direct challenge to President Donald Trump who had issued dire warnings over its missile program. China condemned the test but US Secretary of State Rex Tillerson said Beijing and Moscow bore “unique responsibility” for the growing threat posed by the reclusive North. Under Kim’s leadership North Korea has accelerated its drive towards a credible nuclear strike capability, in defiance of international condemnation and multiple sets of UN sanctions. “Dear Leader Kim Jong-Un expressed great satisfaction with the perfectly successful test and praised its developers,” the official Korean Central News Agency (KCNA) said Saturday. Trump denounced the launch as “reckless and dangerous” and rejected Pyongyang’s claims that such tests helped ensure its security. “By threatening the world, these weapons and tests further isolate North Korea, weaken its economy, and deprive its people,” he said. The heads of the US and South Korean militaries discussed “military response options” after North Korea’s launch, the Pentagon said. South Korea and Japan convened meetings of their national security councils. And the US and South Korean militaries began conducting a live-fire exercise using surface-to-surface missiles in response to the latest test, the US army said. Analysts said the missile appeared to have a range of around 10,000 kilometres (6,200 miles), which would put the US mainland with reach. “Based on current information, today’s missile test by North Korea could easily reach the US West Coast, and a number of major US cities,” arms expert David Wright of the Union of Concerned Scientists said on his blog. Los Angeles, Denver, and Chicago appeared to be well within range of the missile which may also be capable of hitting Boston and New York, Wright said. Tillerson said Pyongyang’s main ally Beijing, together with Moscow, bore responsibility for the growing threat from Pyongyang. “As the principal economic enablers of North Korea’s nuclear weapon and ballistic missile development programme, China and Russia bear unique and special responsibility for this growing threat to regional and global stability,” he said. In a standard response to the test, Beijing urged restraint by all sides. “China opposes North Korea’s violations of UN Security Council resolutions … At the same time, (China) hopes that all parties concerned will exercise caution and avoid intensifying tensions” on the Korean peninsula, a foreign ministry spokesman said. North Korea’s unrelenting pursuit of its missile and nuclear programmes poses a thorny policy challenge for Trump, who is at loggerheads with Beijing over how to handle Kim’s regime. Joel Wit, a senior fellow at the US-Korea Institute at Johns Hopkins University and an expert on the North’s nuclear weapons programme, said Friday’s launch confirmed time was running out for Washington to find a way out of a pressing security crisis. “Another North Korean test of what appears to be a missile that can reach the United States further emphasises the need for the Trump administration to focus like a laser on this increasingly dangerous situation,” Wit said on the institute’s 38 North website. US military and South Korean intelligence officials had in recent days warned that North Korea appeared to be prepping another missile test — likely of an ICBM. 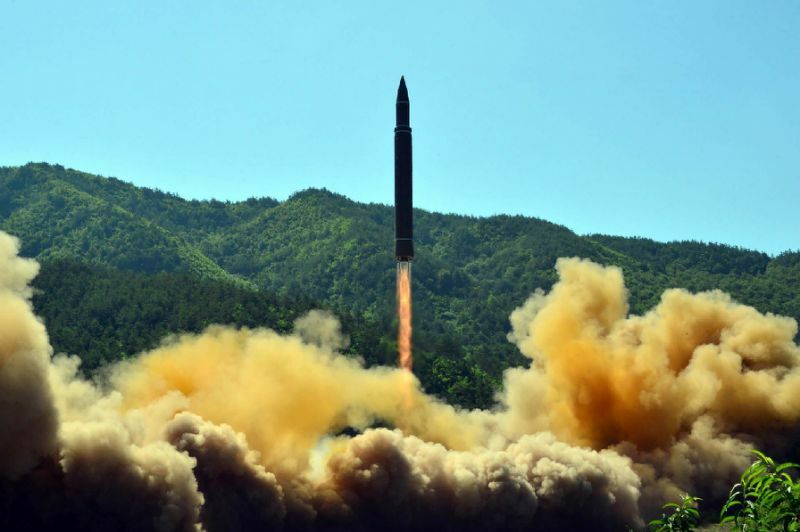 The North’s ICBM test on July 4 triggered global alarm, with experts saying the missile had a theoretical range to reach Alaska. There remain doubts whether the North can miniaturise a nuclear weapon to fit a missile nose cone, or if it has mastered the technology needed for the projectile to survive re-entry into the Earth’s atmosphere.